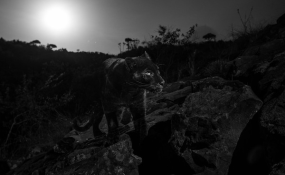 On the night of the full moon, the black leopard reappeared. A story that claimed a rare black leopard had not been seen in Africa for 100 years has left Kenyans up in arms. A feature by National Geographic has reported this is the first animal of its kind to be spotted in almost a century. The headline screams: "Black leopard spotted in Africa for first time in 100 years." "As recently as 2017, only a single sighting had been confirmed - a photograph taken in Addis Ababa, Ethiopia, and stored in the collections of the National Meseum of Natural History in Washington D.C," the report says in part. That is not true. A similar coloured animal was captured by former Nation photojournalist Phoebe Okal in 2013. Understandably, Kenyans sneered at the story on social media. The Black Panther of Laikipia has been spotted by locals for eons. A foreigner taking photos of something locals have seen for years isn't extraordinary. It also isn't the first time it's been photographed in 100 years. For the first time in 100 (white) years, white eyes have taken a photo of a black leopard/panther.